Sometimes even the most dedicated winter cyclists need some incentive to brave the chill and icy streets, and there's nothing that warms you more than a favourite meal. This is part of a dandyhorse winter series where we track the winter riding habits of cyclists and follow them along to their favourite restaurant, where they tell us about their favourite dish on the menu. Why do you ride in winter? 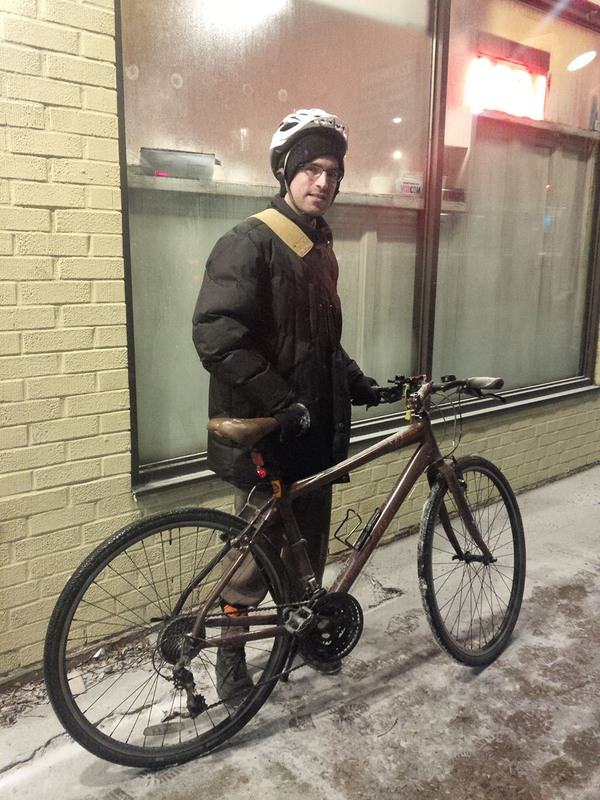 Even when it's snowing or twenty below, the same reasons for riding a bike apply as in the summer. It is faster than driving and the TTC, provides good exercise and leaves me in a more positive mood. However, I will only do trips of 30 minutes or less during winter weather. What makes it more challenging that summer riding? One of the most important challenges with winter cycling in Toronto is manoeuvring around streetcar tracks – given they are very slippery and it's easier to get your tires caught. Personally, I have had a few close calls. If there is a significant amount of snow on the ground, finding bike parking which is easily accessible can be another challenge. What are your tips for new winter cyclists? New cyclists may want to walk their bicycles across streetcar tracks to avoid getting their tires caught, but should cross them at a 90 degree angle if they choose to ride across. Using residential streets is a good place to start and a suggestion specific to Ward 14 is to take Sorauren instead of Roncesvalles in order to avoid streetcar tracks and poorly maintained bumpouts. Since winter months get dark early, I recommend bringing an extra set of batteries for your lights (or a low cost spare light if yours is charged via a USB cable) to avoid getting a $110 fine. What do you wear while winter riding? Aside from the usual clothes, I will put on a winter coat, a hat underneath my helmet to keep my ears warm and gloves. Sometimes I'll also put on my Team Canada scarf, especially when it gets really cold. What modifications do you make to your bike? None. The standard tires on my bike are thick enough to handle snow. I'm a controller for a print company in Pickering and a Co-Captain of the Cycle Toronto Ward 14 Advocacy Group. Our Cycle Toronto group conducted a transportation survey in Parkdale in October similar to the TCAT studies done in the Annex (2009) and Bloor West Village (2010), the results from which we hope to release this spring. We also hosted several Mini Mass rides of varying themes in order to increase our presence in the neighbourhood. I also maintain a personal blog and am in the process of getting back into photography. What's your fave (winter) food and restaurant? Tell us about your favourite dish there? One main complaint I have with Toronto's independent coffee shops is most of them close at 6 or 7 p.m. during the week. One that I discovered recently – Coffee and All That Jazz at Roncesvalles and Howard Park – is open until 9 p.m. 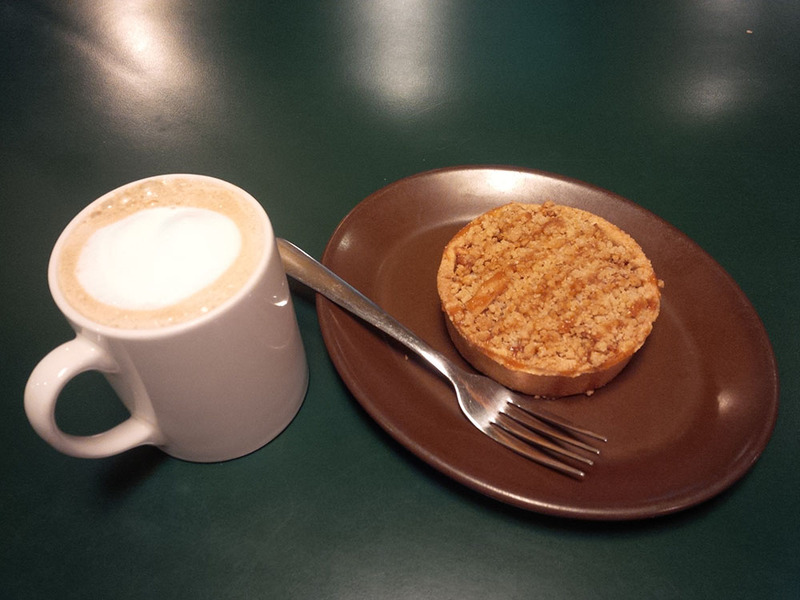 They offer a laid back atmosphere and unique pastries like the Apple Crumble Tart I had during my most recent visit, which is excellent with a latté. The Whoopie Cookie is another good choice, though they also offer sandwiches which I haven't gotten around to trying yet. Tell us a bit about the route you ride to the restaurant? I prefer direct routes when possible. In my case, that means taking King from my home on Dufferin and then up Roncesvalles to Howard Park. If it is really bad outside, I will take Jameson and Sorauren to avoid Roncesvalles.